Gresham was one of the wealthiest men in England. In this letter, he writes to inform his queen that he has arranged loans secured on the Antwerp Exchange from 15 bankers (who are listed in the letter), totalling £128,449 3s 4d. This was to help finance the first war of Elizabeth’s reign – her eventually successful attempt to eject the French from Scotland. Given that the Crown’s entire annual income was normally around £250,000, it was a substantial loan. 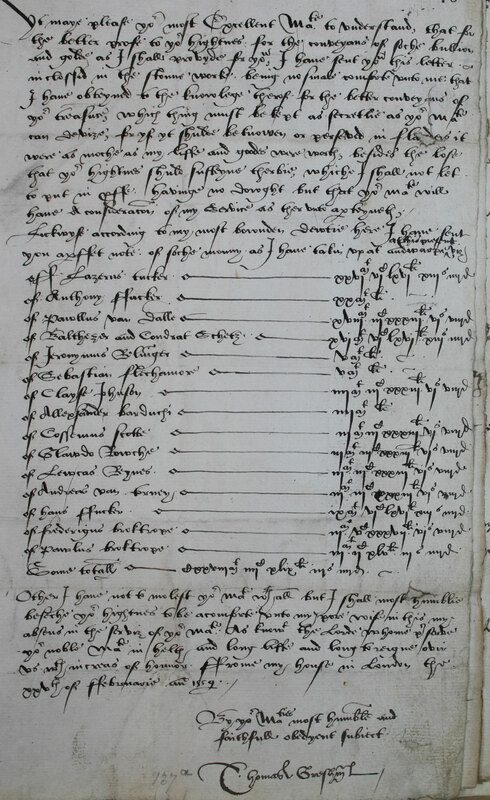 The export of bullion from the Low Countries was prohibited, so Gresham used various subterfuges – such as on this occasion concealing it in some ‘stonne work’ [stonework], along with his letter. He wrote it when he was about to embark for the Netherlands to serve as ambassador to the Duchess of Parma, who was regent. In contrast to her father, Henry VIII, Elizabeth was averse to waging wars, which were ruinously expensive. Other I have not to molest your Majestie withal but I shall most humblie beseche your highthnis to be acomforte unto my pore wife in this my absens in the serviz of your Majestie. As knowest the Lorde whome preserve your noble Majestie in helth and long liffe and long to reigne over us with increas of honour. Ffrom my house in London the xxvth of ffebruarie anno 1559 [1560 N.S.]. By your Majesties most humble and faithfull obedient subject. Thomas Gresham.